Hey guys! It’s sweltering outside, and summertime means only one thing: Vacation! Of course, you won’t be going anywhere if you spend all your money on a desk, which is why this week’s blog is all about saving you money. Standing desks being the raging success that they’ve become, everyone wants one. Government agencies, schools, offices, and average Joes and Janes all want their own slice of this new fad, and producers are chomping at the bit to accommodate that hunger. It’s not at all uncommon to find standing desks made of space age materials retailing for several hundred or even several thousand dollars. They look great, they’ll charge your iPhone, and they’ll live longer than you will, but when you get down to brass tacks, who wants to spend their mortgage payment on a desk? Most people aren’t quick to volunteer for that assignment! That’s where the cavalry comes in – and from a most surprising source. IKEA has been a friend to college kids and bachelors for eons now. Their furniture is stylish and affordable all in a measure, which is a combination you don’t often come across. As if that weren’t enough, it turns out you can actually use odds and ends from their catalogs to cobble together your own improvised standing desks. Check below for some sweet examples! The first standing desk you can make from random bits and bobs from IKEA is a tripartite combo involving the Lack table, an Ekby shelf, and a couple sets of Bjarnum brackets. You won’t get any bells and whistles in the finished product, and you’ll need to do a small bit of DIY work / handicraft, but the end result will be a roomy, useful desk for roughly $60 USD. The Double Decker is a great option for a studio apartment or other small space. You’ll need to get your hands on two of the twenty-four by forty inch Vika Amon table tops, four Vika Curry legs, and four Ekby brackets. 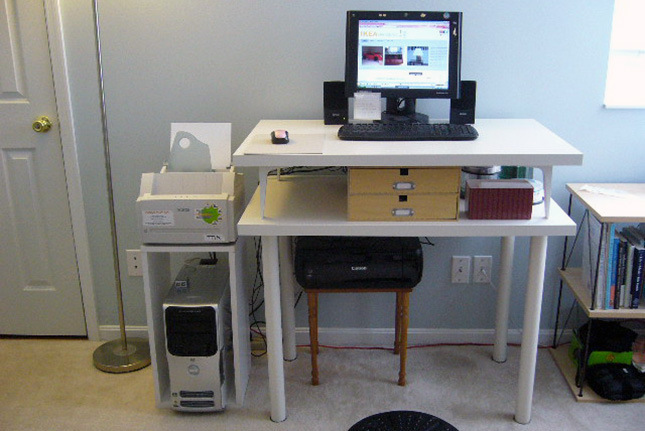 Like the first entry on this list, you won’t be making anything fancy, but the standing desk that you do end up with should be perfectly adequate for light to medium use in any home office. Total costs should run you $60 USD or so. This is a really cool standing desk for those people who value an open, artsy aesthetic in their home or work area. It almost looks like something handmade, as if you plucked it out of a log cabin, and I suppose that’s the point. By the by, this desk is pricey and work intensive for the looks and solidity it offers (it’s the first adjustable standing desk in this post), so bear that in mind before you begin this project. Supplies – two Finnvard trestles, four pieces of red oak cut to size, a drill and various bits, and a Linnmon tabletop in whatever color you like – will cost you about $250 USD. Project completion should take a couple of hours. Contrary to what you may have heard, standing desks can present a real workout, and like all forms of exercise, some folks need a little nudge when it comes time to make the transition from a sedentary lifestyle to a more active one. If you or somebody you know needs some training wheels to get them into the standing desk lifestyle but you happen to do most of your work from home, then this next IKEA hack is a perfect fit! Take one Lerberg shelf, throw in one Gorm basket, and complete the build with a Kassett box. When assembled, these units will turn into a standing desk that provides storage at the bottom, racks for tech at the top, and a solid table in between. It takes less than thirty minutes to assemble, it’ll fit in a corner, and it’ll cost you right around forty bucks ($40 USD). If you’re in an office environment and you’re trying to make the transition to a healthier way of working, consider this next budgetary end run. Take a Lack side table and mount it on top of legs you cut to size from two-by-twos. The table costs ten dollars, while the legs can be picked up for a song at any hardware supply store, especially in bulk! 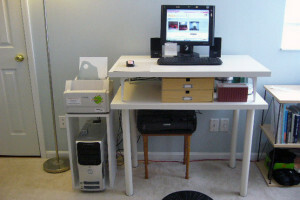 Additionally, the footprint for this “standing desk lite” option is virtually nil, so you can really save on office space. On the other hand, if your bosses find this option to be a bit too “hands on”, consider retooling old filing cabinets to meet your new needs. The combination of two and three-drawer filing cabinets makes a great standing desk mock up. 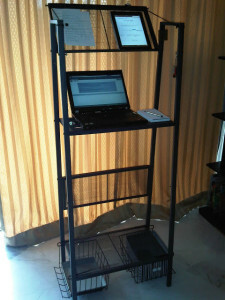 The idea with these options isn’t to replace a real standing desk outright. Rather, the intent is to mimic the feel and function of a standing desk while causing a minimum of fuss and fiduciary impact. Cost: $0-30 USD. This little trick is as simple as it gets: IKEA is the king of cheap, functional furniture. You can get everything from dishes to king-sized beds with nothing but a phone call, so why should a standing desk be an obstacle? It shouldn’t, which is why they offer one for roughly $70 USD, the IKEA PS2014. Standing desks are great things to have around, but they can be a real hit to the wallet. Now you know they don’t have to be! Just remember to get the necessary accessories if you choose to take a stab at the IKEA inventions listed here. Thanks for reading, and see you next week!